Small (6-12 months) - $29.99 Medium (12-18 months) - $29.99 Large (18 months-2T) - $29.99 Only 3 left! Hey! We have a riddle for you. What is orange and white, and cute all over? Give up, yet? 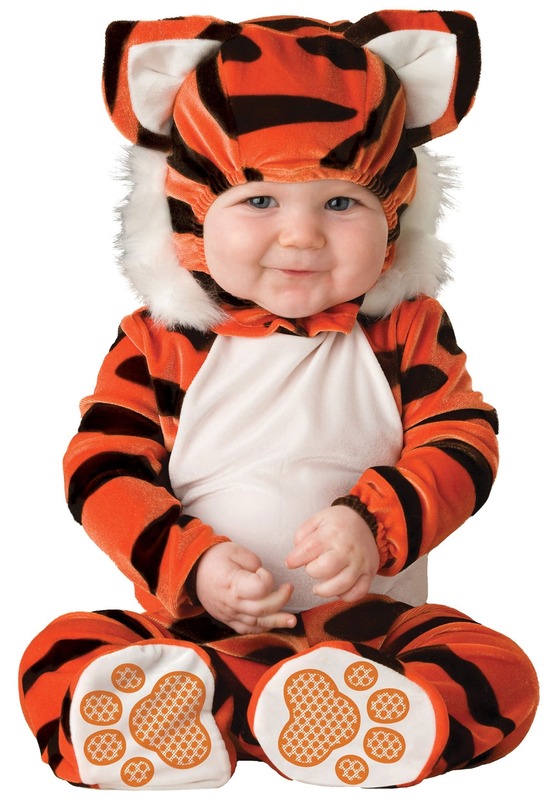 Well, the answer is your little one in this awesome Infant Tiger Costume! Grab this for your kiddo and you can have the cutest tiger cub in the whole neighborhood this Halloween. Once you slip this adorable jumpsuit on your cutie, he or she will be ready to stomp all around the block like a wild jungle cat. Oh, and you won’t need to worry about your tiny tyke slipping around at any fun costume parties. This jumpsuit comes with skid resistant feet with grips in the shape of pretty little paws. So, whether your baby is running through the thick of the jungle or crawling around your slick kitchen floor you can be sure that he or she will never lose their grip! However, this adorable getup wouldn’t be complete without the cute hood. It has a pair of the softest ears you’ve ever felt on a tiger and there is also a furry little white mane to keep your bundle of joy cozy and warm. If you really want to take this costume to the next level and complete this cat-tastic transformation then grab a makeup kit. With a quick makeover, your blushy-cheeked cutie will look exactly like adorable tiger cub! Just be sure to keep an eye out for animal control. You wouldn’t want to have to visit the zoo in order to get your baby back. The costume is neon orange and shiny. Looks very cheap. Returned it.